You CAN get the kids dressed up with minimal tears in the process! Ask my 4-year-old daughter Ellie what she wants to be for Halloween and she’ll tell you a cat. Ask her the next day and she’ll tell you a witch. Wait a few more days and then ask her again. She’ll tell you a mermaid-cat-witch. You get the idea. I’ve dealt with this costume conundrum for the past 10 years with all three of my kids. It’s been one of the most hilarious and expensive Halloween-inspired parenting battles I’ve experienced. As cute as it is to see my little girl change her mind about what she would like to be for Halloween, I’d like to celebrate this year’s holiday with minimal tears in the costume department. Tackle the the issue like a pro with these five simple tips. 1. WAIT UNTIL THE LAST POSSIBLE MOMENT. Yep. Seriously. You might think this is a bad idea, but unless your child is 100 percent sure she knows what she wants to be for Halloween, just wait it out. We’ve all had those years, OK, maybe two, when our child goes through a Princess Sophia or Sheriff Callie stage. When that season of character obsession comes along, by all means … get the costume. But your child will some day move on to like a variety of characters and mythical creatures (unicorns anyone?) and every time I’ve been to the store right before Halloween, there has always been a costume my child will wear. I repeat, there has always been a costume my child will wear. It may not be the exact costume she wanted, but since she couldn’t make up her mind to begin with, she’s easily swayed into being the best Princess Leia around town. Who doesn’t love a fun game of dress-up? I know my kids do, and we’ve had some of our best memories chasing each other throughout the house with me in a Ninja costume and my three kids piecing various bits of random costumes together. One time I saw Ellie come downstairs with a Spider-Man mask on her face, a cat costume on her body and riding a stick pony. I know you can relate. 3. BORROW A FRIEND’S COSTUMES. You know those character obsessions I talked about earlier? If your son wants to be the Hulk this year, seek out the friend whose son has already gone through his Hulk season in life and ask her if you can borrow his costume. The answer may be no if her son is planning on being the Hulk again this year or if he’s super territorial about his costume. Chances are, she’ll think the idea of trading costumes is brilliant. 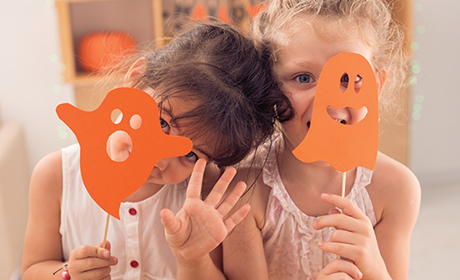 Return the favor by offering up one of your son’s costumes and if you don’t have anything fun between the two of you, bring another friend into the mix. 4. HEAD TO THE RESALE STORES. These stores are your best friends and if you don’t know that by now, don’t worry, there’s still room for you. These are the stores you want to go to if your child changes her mind every day about what she wants to wear. You can buy three costumes, maybe even four, for the price of one brand-new costume which means it’s OK if your daughter changes her mind the day of Halloween because you’ll have several back-ups. You might even find what she’s looking for with the tags still on. It’s happened before. My favorite thing about these stores is that you’ll often find costumes that weren’t even on your radar. Resale stores always have a great selection of current characters but they also have ones that you might not have thought of but that your daughter loves. 5. SHOP FOR NEXT YEAR’S COSTUME AFTER THIS HALLOWEEN. If you don’t know this tip by now, you need to get on the bandwagon. The day after Halloween, costumes will go on sale but not low enough that you want to start buying them. You’ll need to wait three to five days before costumes get down to 70 - 90 percent. Most will be picked over but they’ll be so cheap, you can piece different costumes together or keep them for you kids’ dress-up bin. You’d be surprised how many times the same costume comes out the very next year or a similar costume comes out with only one or two minor changes from the original. You can often get these super cheap after Halloween and just tuck them away at home for the following year. Plan on spending some time digging through the racks though. Sometimes costumes are folded, dropped or tucked behind random items in the store from people who were going through them just like you are now. Their idea of the store not having a good selection just might be your jackpot for finding the perfect costume. Meagan Ruffing is a freelance parenting writer living in northwest Arkansas. She looks forward to hearing what her kids want to dress up as this year and letting them eat more candy than they should on Halloween.